Q: What do Titanic and Picasso have in common? The very same image of Picasso’s1907 painting “Les Demoiselles d’Avignon” (a work that did not sink with the doomed ship) was used already in the original 1997 version, and another copyright infringement claim was settled at the time of the original release. However, the first settlement did not contemplate the new version of the film and with the new use comes the new claim. 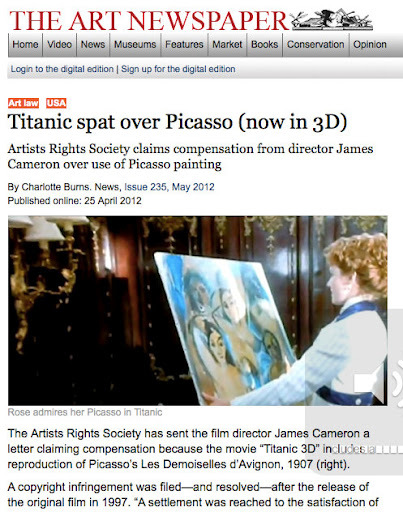 After all, the Picasso estate did not give its permission to use the painting in 3D. Spectators can only speculate as to the enhanced qualities of the impending settlement. Previous Previous post: Protect Cultural Heritage This Summer!